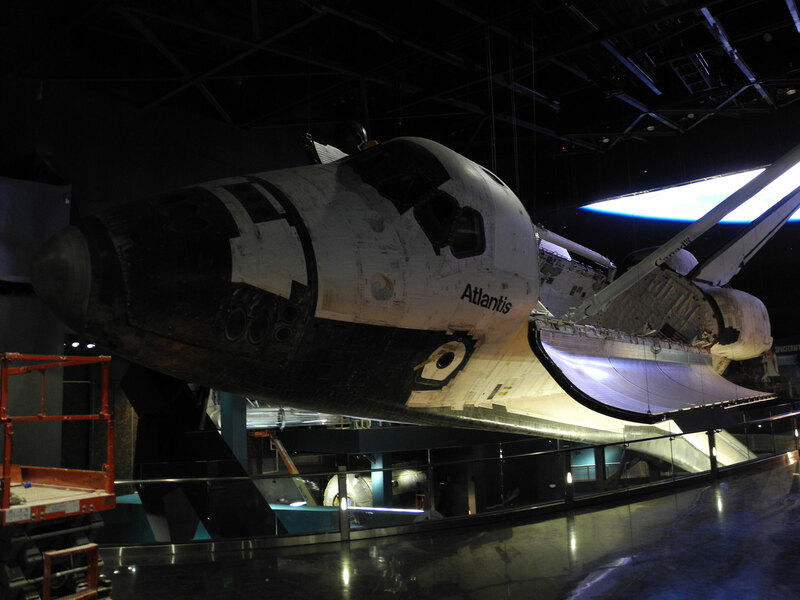 It was the last space shuttle to go into space, so it’s fitting that Kennedy Space Center Visitor Complex constructed a $100 million, 90,000-square-foot facility to honor one of the most complex machines ever built by mankind—Space Shuttle Atlantis. 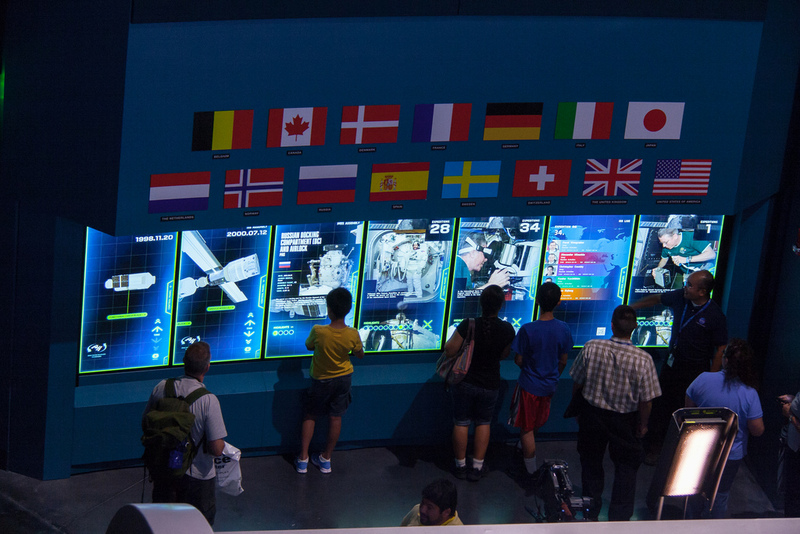 Unified Field’s designers, programmers, writers, and 3D modelers crafted eleven interactive programs for the Space Shuttle Atlantis attraction, which features multimedia walls, simulators and augmented reality viewers that make it possible for anyone to walk in space, fly Atlantis or tour the International Space Station. I developed four different simulator interactives for the museum in addition to supporting some of the OpenGL and multitouch functionality on the large media walls. 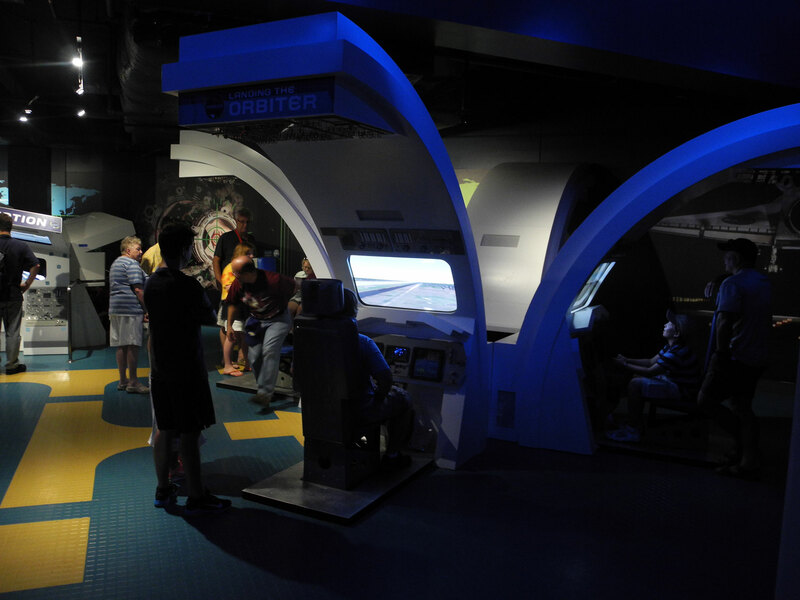 Landing was a flight simulator that allowed visitors to land the Atlantis at the Shuttle Landing Facility. 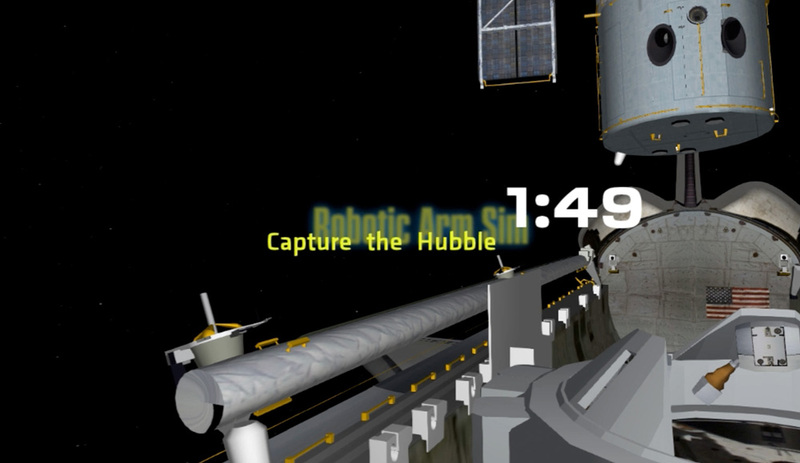 Robotic Arm and Docking were five-screen installations that simulated in-orbit operations, and EVA was a gesture-based (kinect) installation that let the visitors embark on a virtual spacewalk. 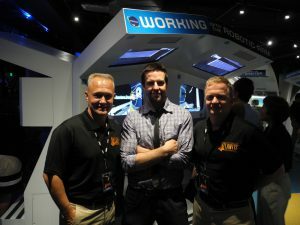 40 astronauts were at the opening night party and represented crew members from all of Atlantis’ missions. 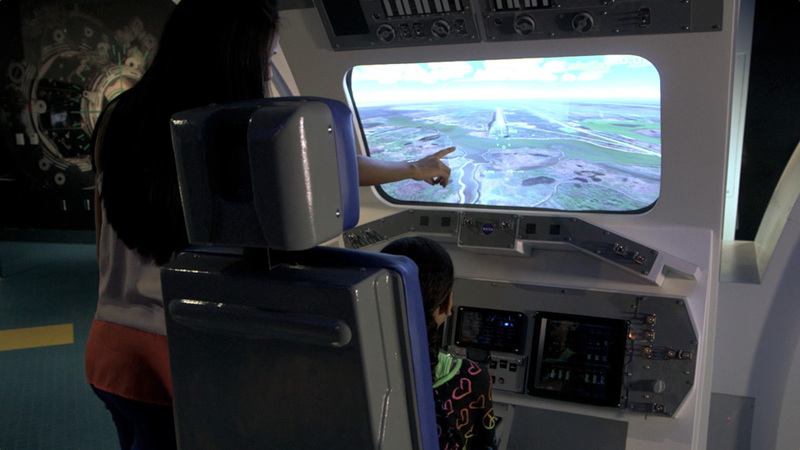 The Landing Simulator allowed a visitor to try landing the Atlantis. 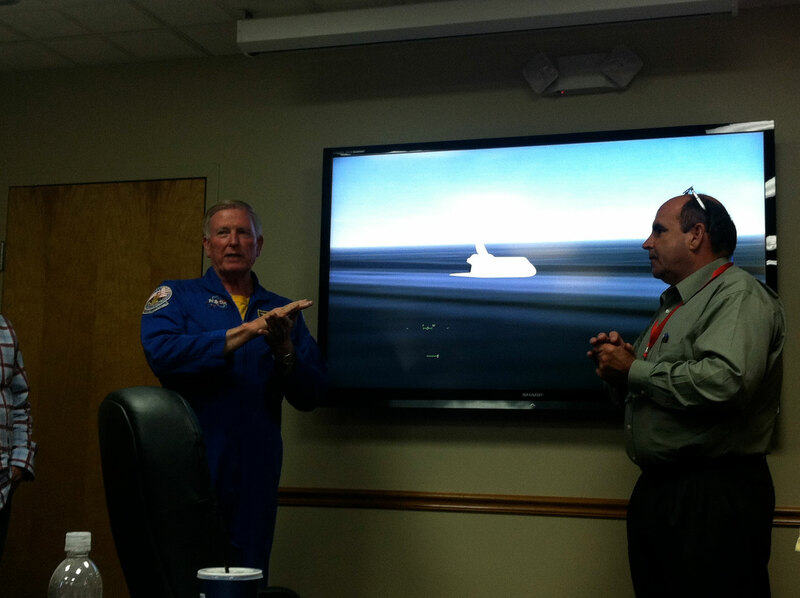 During a kickoff meeting Astronaut Jon McBride comments on an early Landing Sim prototype. 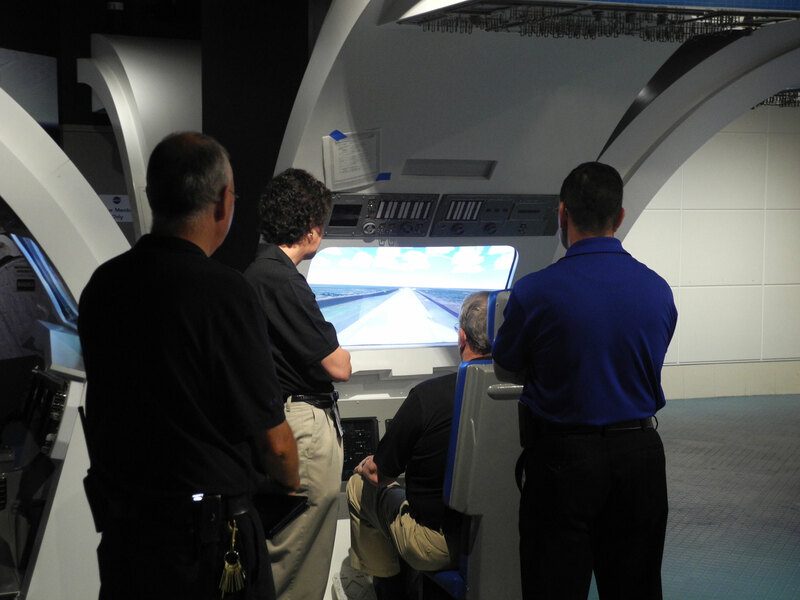 Close to a year later former Atlantis Astronauts played the simulator during the museum’s opening party. 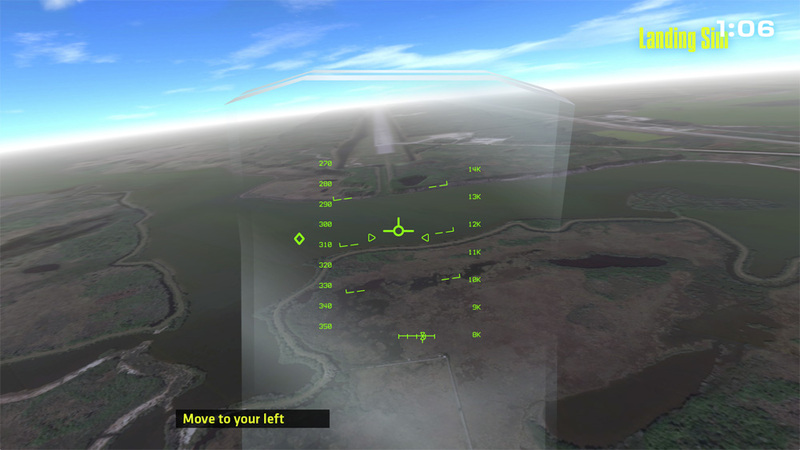 © Unified Field Inc.
A couple in-game screenshots from the landing approach. 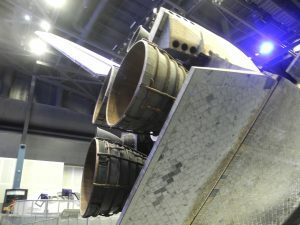 © Unified Field Inc. 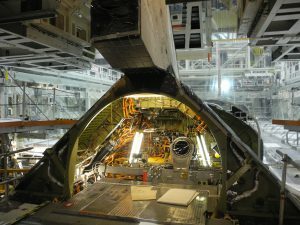 Some images of the sim installation that show the fabricated cockpit mockups. 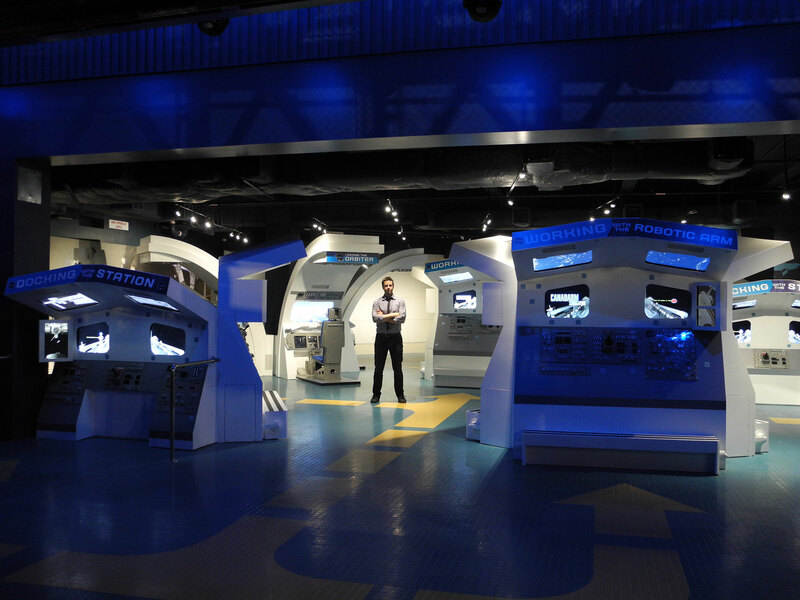 These stations were arranged in quads, there were eight Landing Sim installations total. 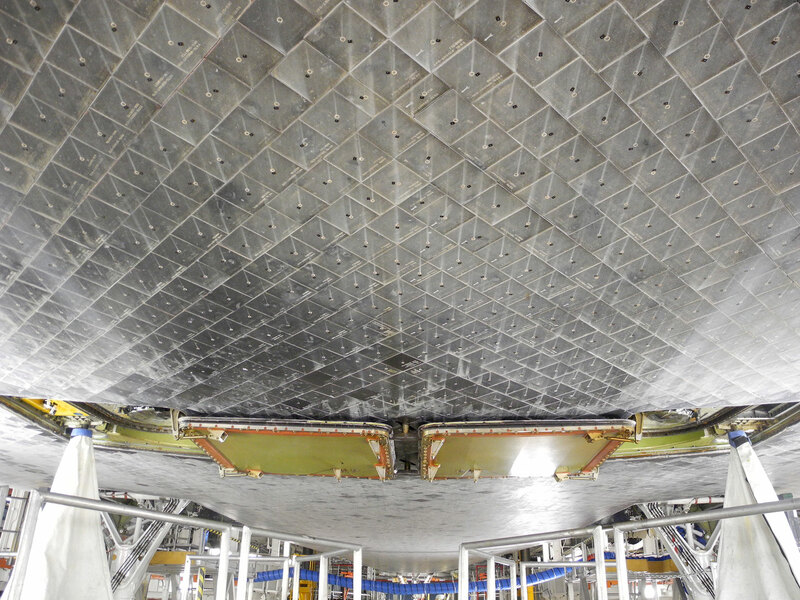 © Unified Field Inc. 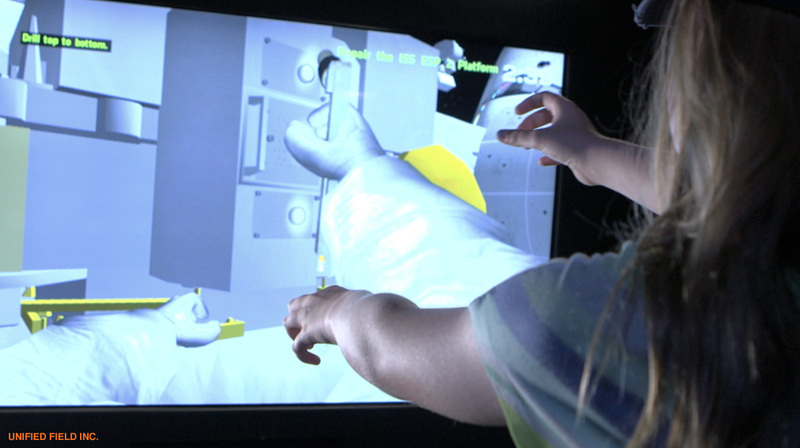 The EVA simulator was a Kinect / gesture-based interactive that allowed a visitor to experience a virtual Spacewalk. They could simulate a Hubble repair mission by using a hammer to loosen a jammed solar array, then release it off into space, or navigate around and repair the ISS using a power drill tool. 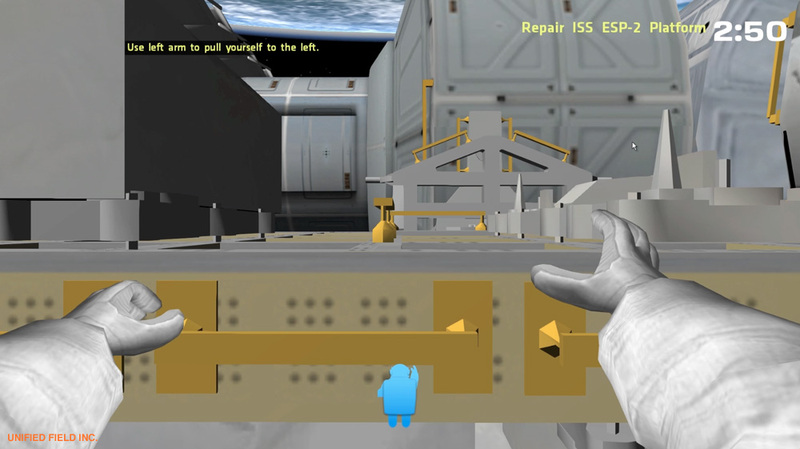 The shots below are of a user gesturing and an in-game screenshot of the ISS drill mission. © Unified Field Inc. 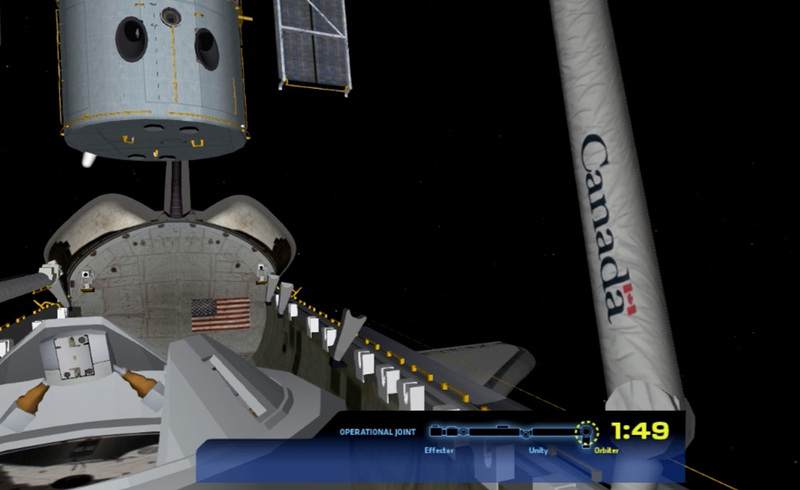 Grabbing the handle on the solar array. © Unified Field Inc. 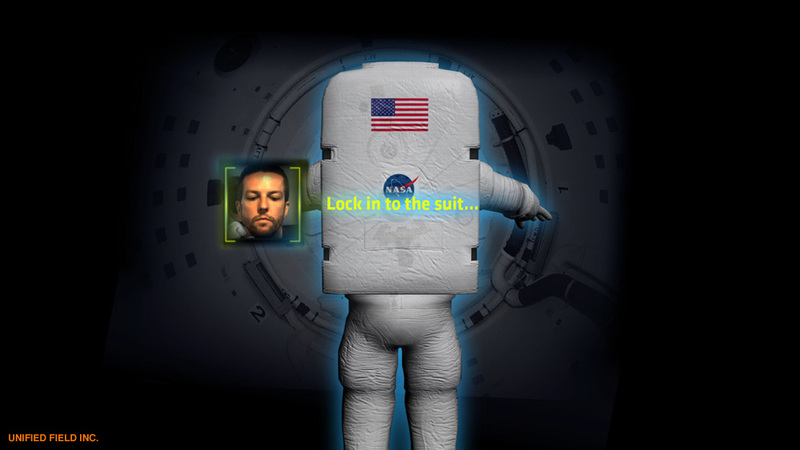 I used OpenCV facial recognition software to find the visitors face during the introduction and save it to a texture. 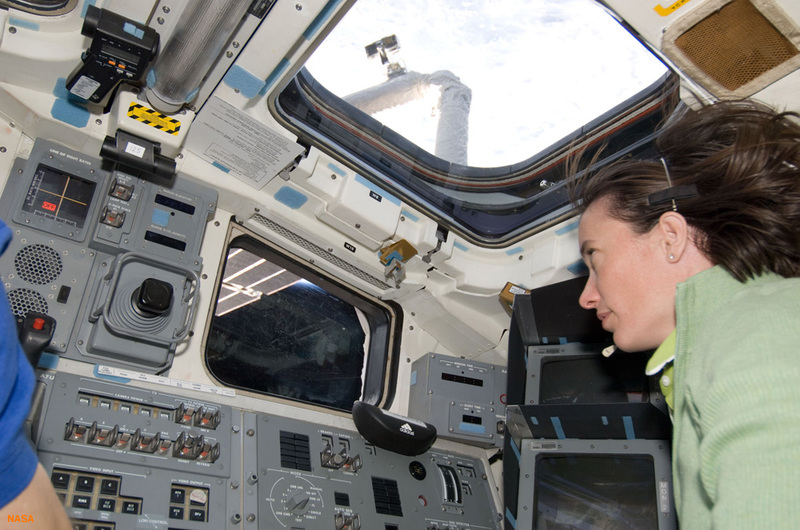 After the mission their face is revealed in the helmet of the space suit. 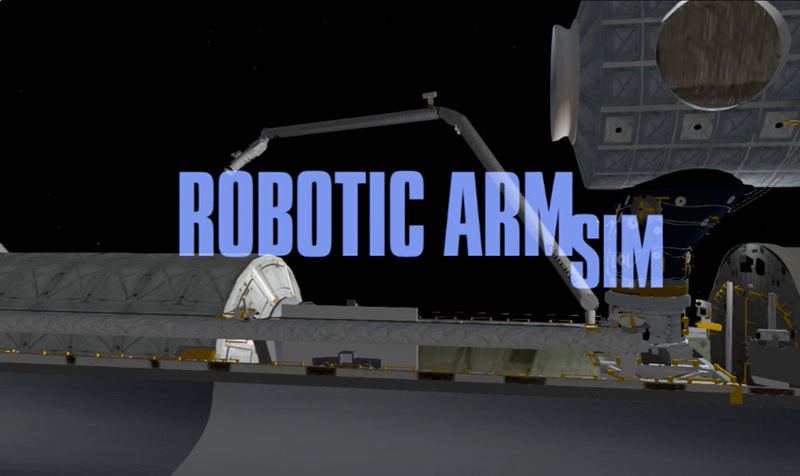 The 3D model of the arms contained a skeletal animation that I manipulated with code. 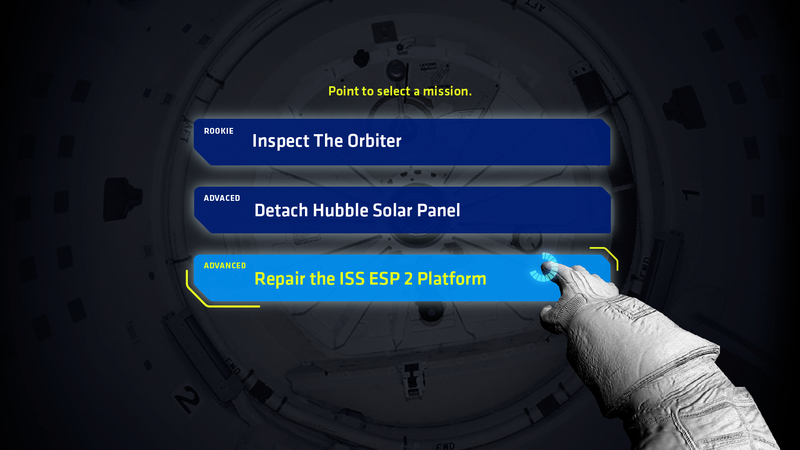 The arms were visible when selecting a mission in the user interface. 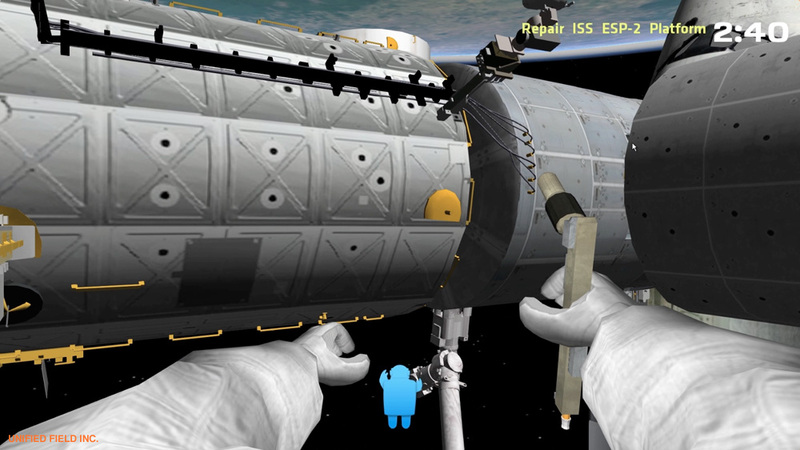 © Unified Field Inc.
At the beginning of the mission, the virtual astronaut emerges from the airlock hatch and moves into position in the Hubble mission. 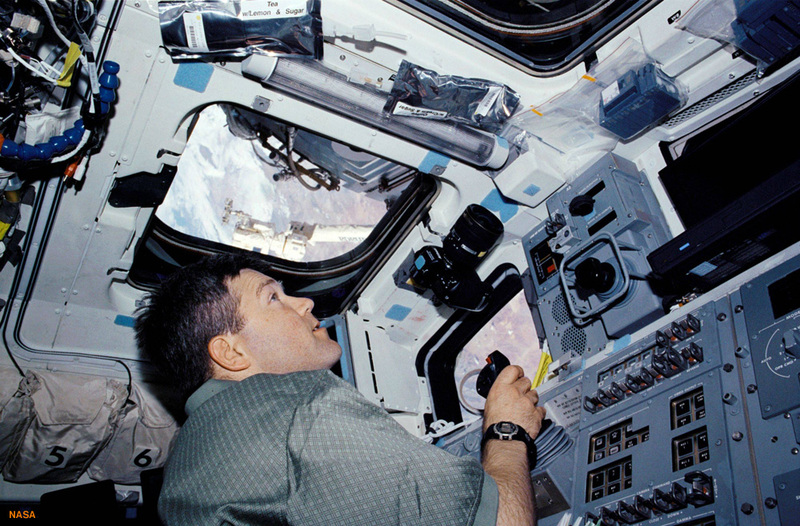 Navigating around the ISS using handholds and getting into position to use the power drill which was modeled after an actual power tool used by astronauts. 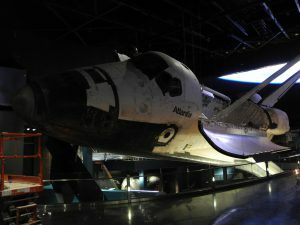 © Unified Field Inc. 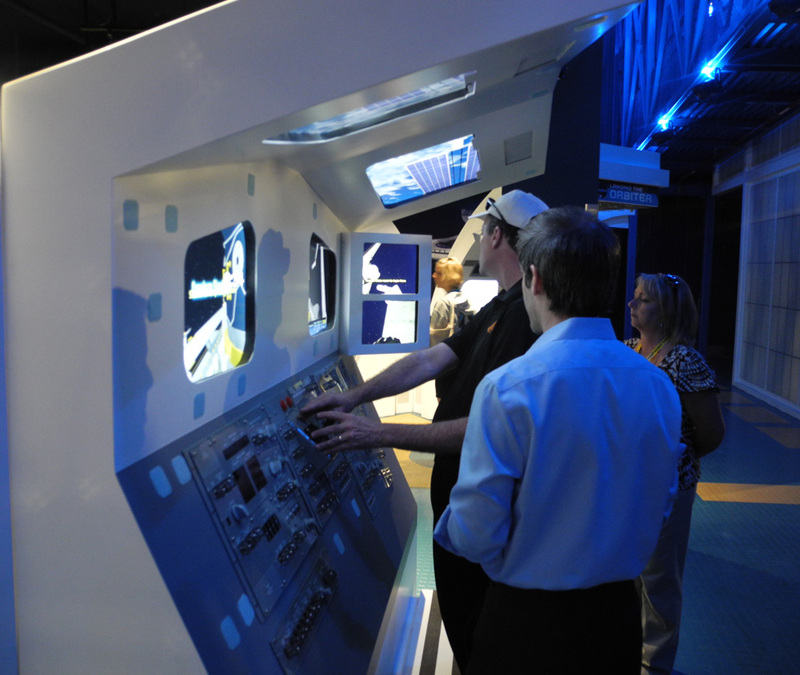 The Docking and Robotic Arm simulator stations were fabricated replicas of the aft portion of the Space Shuttle’s flight deck. 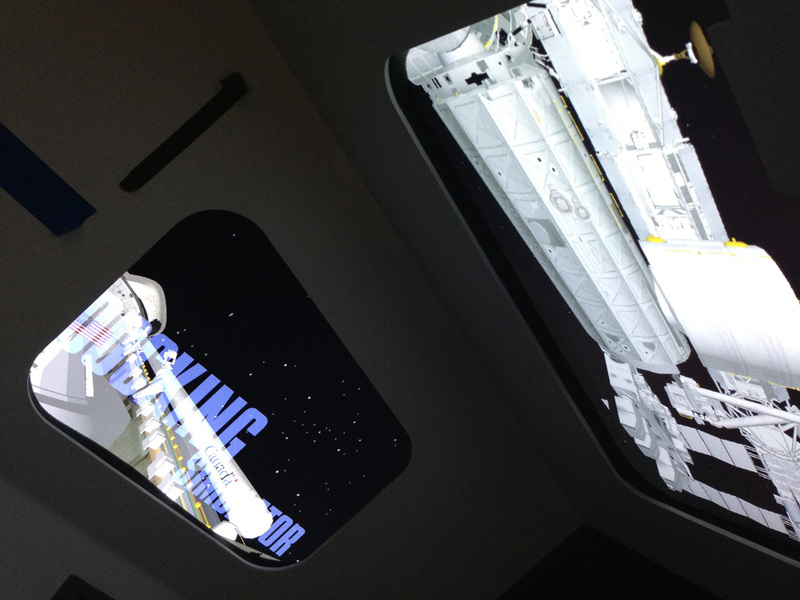 The windows were 3D camera views out into the 3D OpenGL environment I developed and replicated what one would see when looking out the shuttle’s windows. 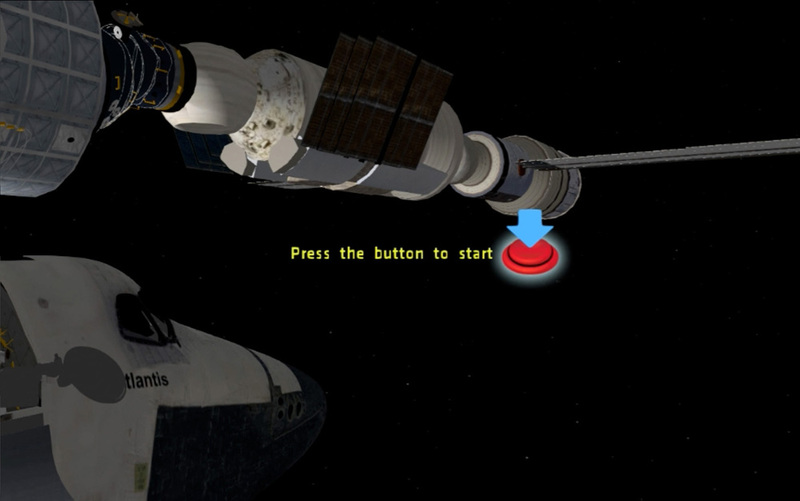 A shuttle pilot would typically dock with the ISS while positioned on the left side of the console so they could look up at the approaching station and view the CCTV camera views of the docking cross hairs for aiming. 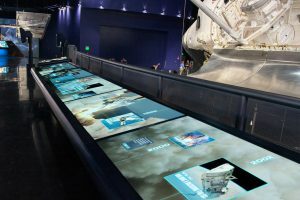 The installation used five screens on two graphic cards and required modifications to our internal Unified Field C++ framework that allowed for the application to run in two OpenGL contexts (one for each graphic card). 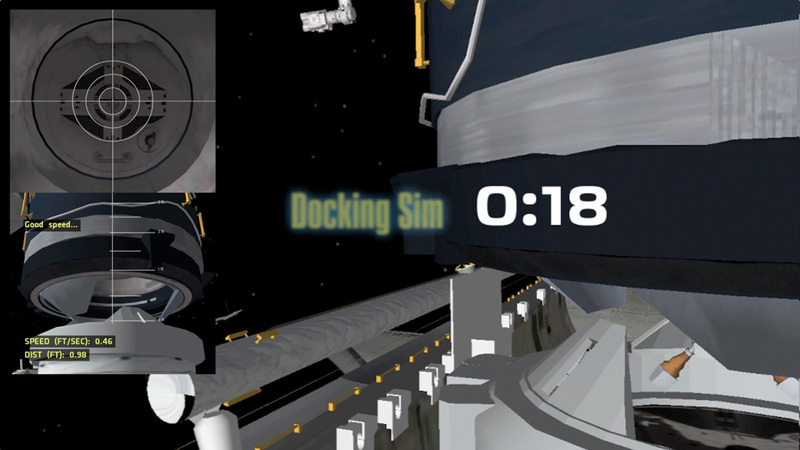 Docking also had a more difficult mode that only allowed for limited fuel. 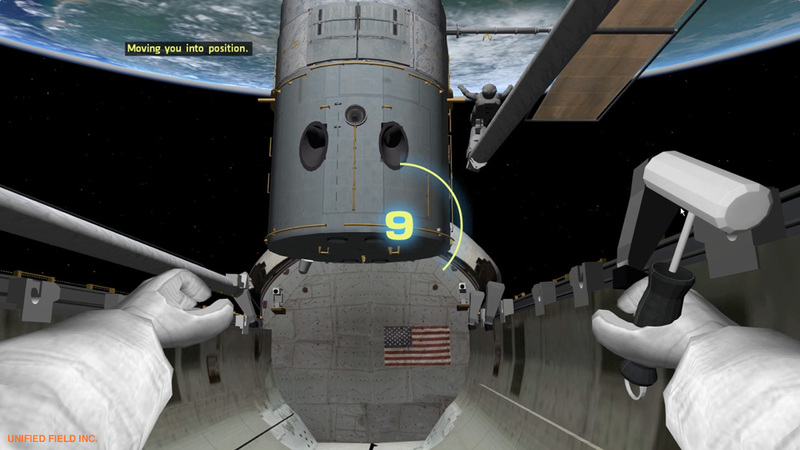 © Unified Field Inc.
An in-game screenshot out the rear left window that shows the CCTV camera views inset with the cross hair, and a shot of the right side windows with the approaching ISS above. 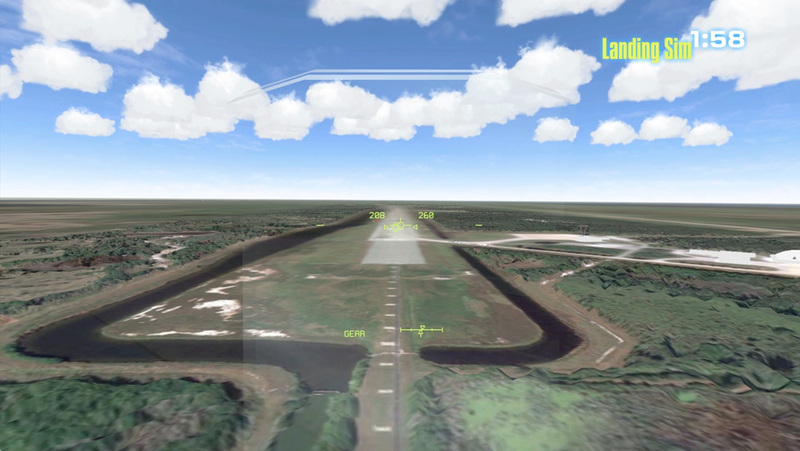 © Unified Field Inc.
A screenshot of what is visible out the rear windows during the attract sequence. 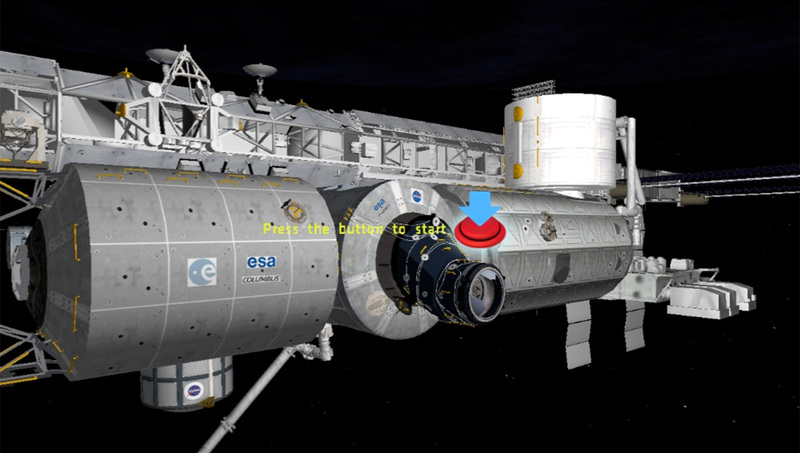 I moved the 3D cameras outside the shuttle during the attract to give a better overview of the positioning of the shuttle and ISS before the mission starts. 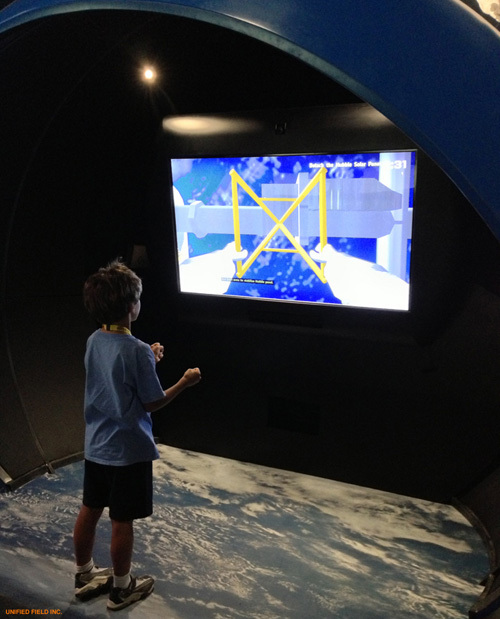 © Unified Field Inc. 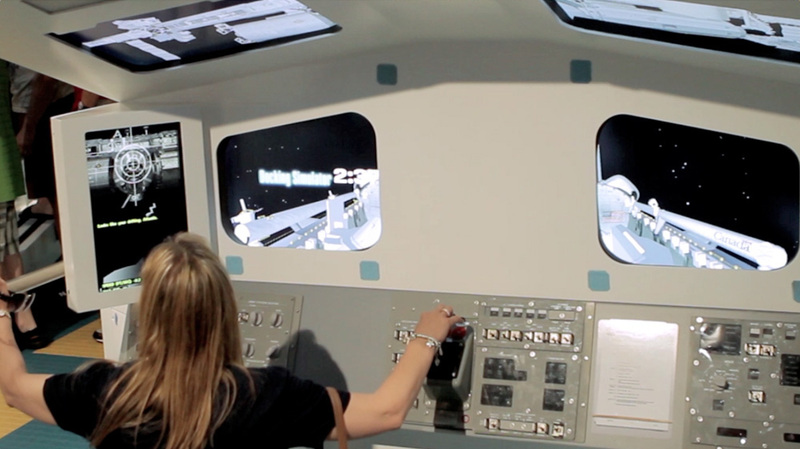 The Robotic Arm simulator was very similar to the set up for the Docking simulator, but the user operated the installation from the right side instead of the left replicating the set up in the actual shuttle. 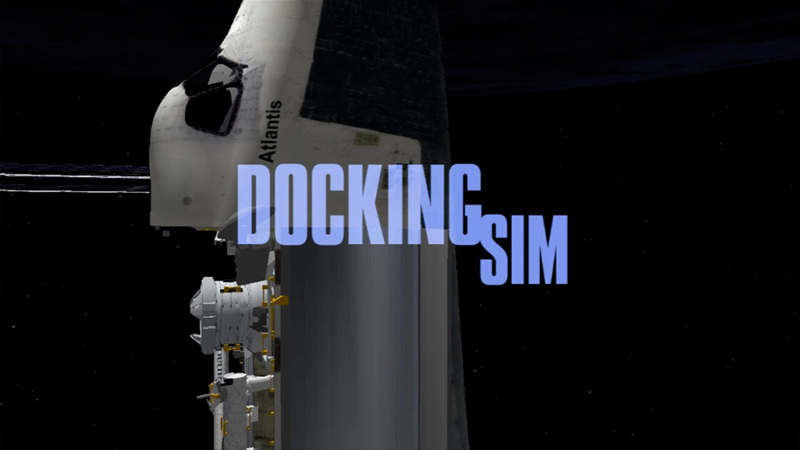 See the Docking simulator description above for more information about the hardware setup. 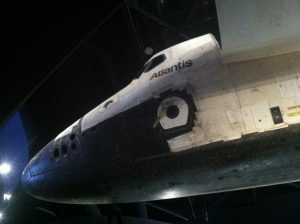 Three missions were available to the visitor: Inspecting the Shuttle wing edges which was an intro to get accustomed to using the arm, raising a section of the ISS out of the Shuttle payload bay, and grappling the Hubble Space Telescope. 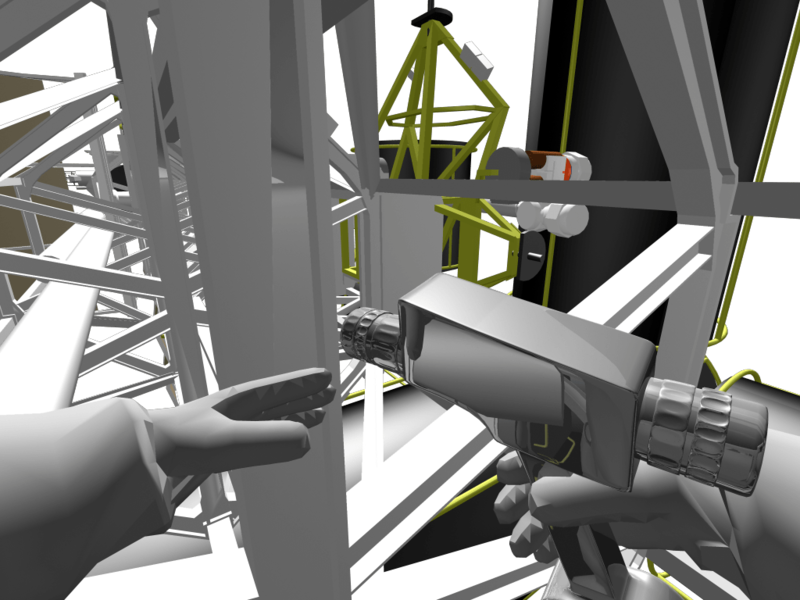 The arm was a little tricky to operate, a user needed to look at multiple screens simultaneously, select which joint of the arm to operate and then move that joint up, down, left, or right to get the end of the arm in the correct position. 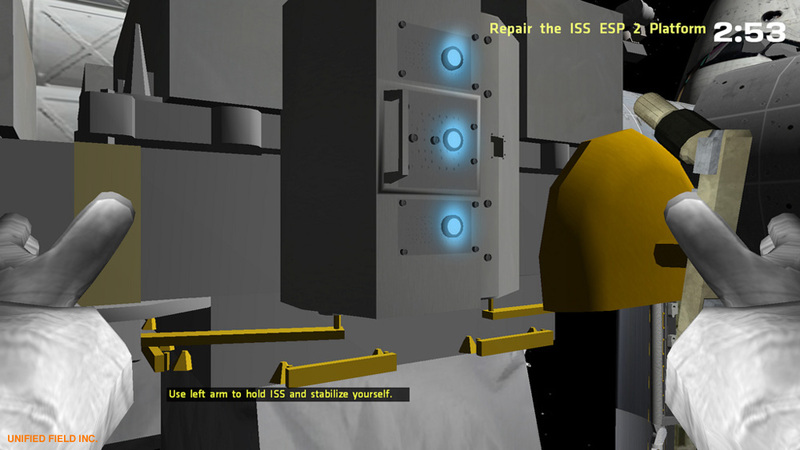 © Unified Field Inc.
An in-game screen shot of the attract sequence showing the Destiny ISS module in the shuttle payload bay, the raised arm, and a early version of the ISS awaiting the new module. 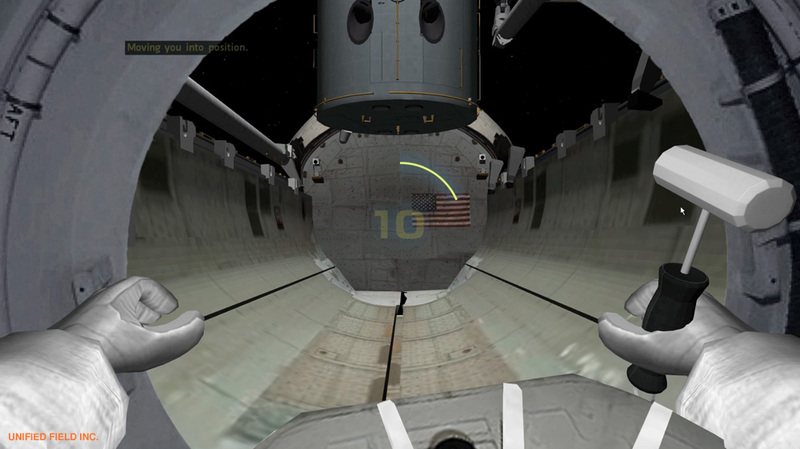 © Unified Field Inc.
An in-game screenshot out the rear windows of the shuttle during the Hubble mission. 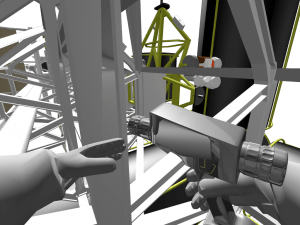 The CCTV camera views are inset here and show vantage points from cameras on the end of the arm and the forearm. 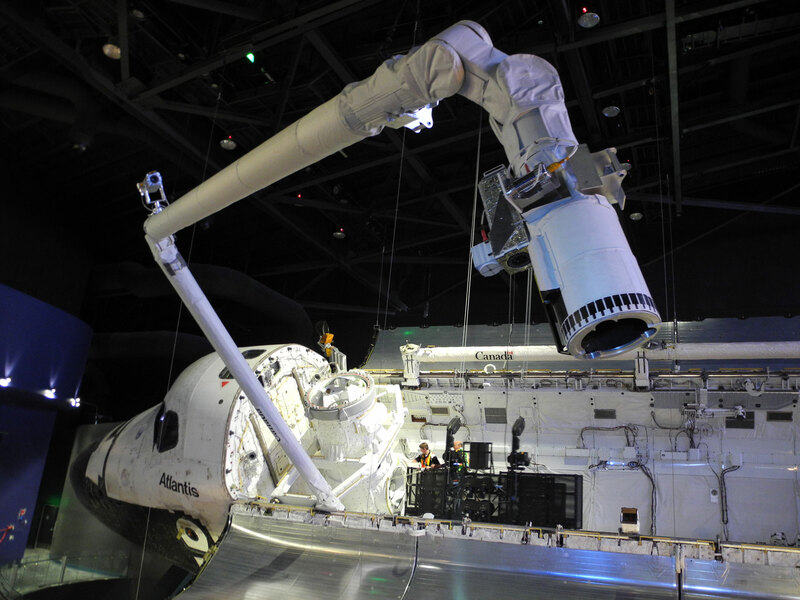 These cameras were used to aim the arm at the grapple points in the game and on the actual shuttle. © Unified Field Inc.